This was a surprise win for our family. Even before Miss A’s arrival, we made it a point to eat more fish. Salmon is hard one because done well, it’s amazing. Done poorly, it’s terrible. On a whim, I tried this Honey-Soy Salmon dish from Parents magazine. It was so easy and even better, Miss A kept asking for more! 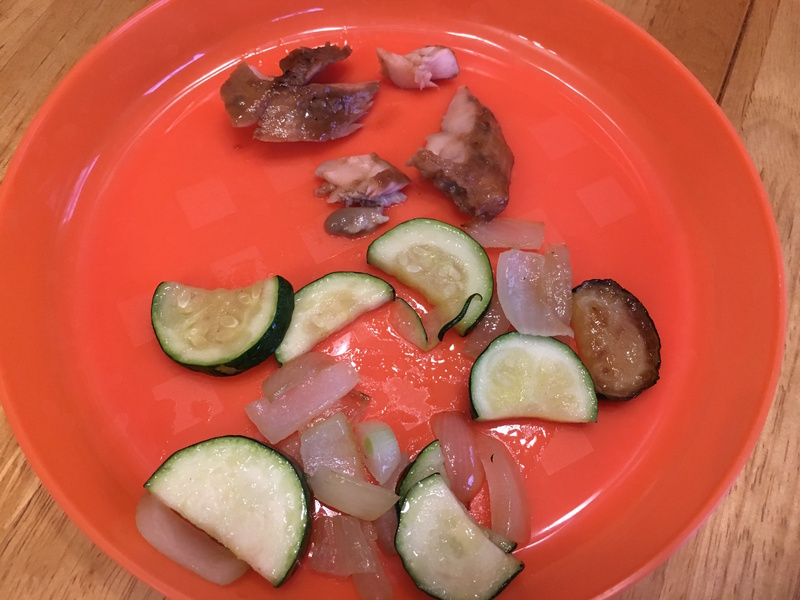 She wasn’t really a fan of the zucchini, but she also hadn’t had it with the skin still on before. Add honey and soy into a zip top bag, squish to mix. Add the fish and seal the zip top. Turn to coat. Marinate for 30 minutes or up to 2 hours (we marinated for about an hour). Preheat broiler. If you have the option of low or high, choose high. Line a rimmed baking sheet with foil and coat foil with cooking spray or lightly drizzle oil. Place fish on foil. Broil 5 to 7 minutes per 1/2-inch thickness of fish, or until fish flakes easily with a fork. We broiled for about 7 minutes total. While the fish is broiling, heat the oil in a large skillet over medium-high heat. Add zucchini and onions. Cook about 3 minutes or until just tender; season with salt. Serve the fish fillets with the zucchini. Note: if using frozen fillets, be sure to allow to defrost before you marinate. It makes a difference. 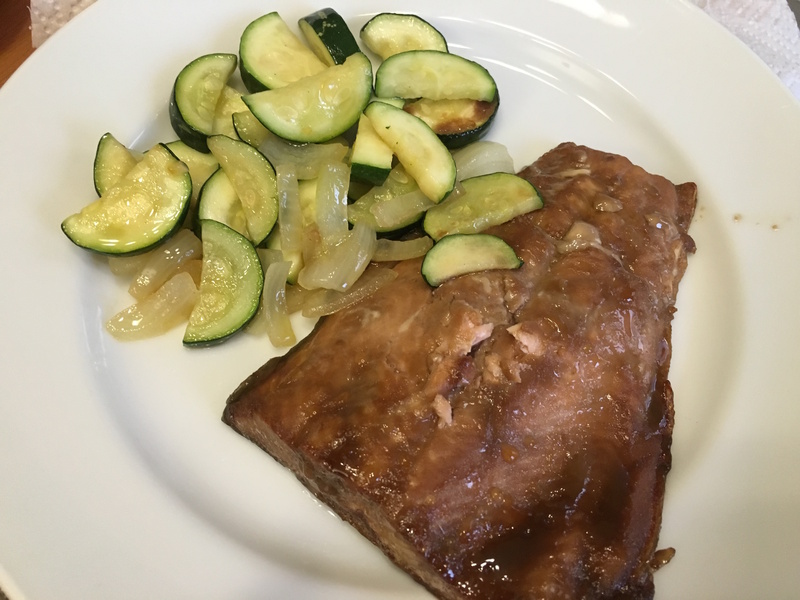 The addition of lightly caramelized onions made the salmon even tastier. We will absolutely be making this dish again. Plus it was so easy, we could make it even on the busiest weeknight!